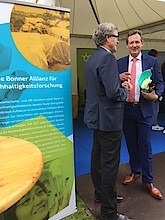 The Bonn Alliance for Sustainability Research presented itself at the Open Day of the Villa Hammerschmidt, the Bonn residence of the German federal president, in tent 29 on Sunday, 24 June 2018. BICC was part of the topical cluster ‘Migration and Mobility’. 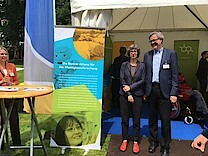 On 24 June 2018, the Villa Hammerschmidt and the Bonn office of the German Federal Ministry for Economic Cooperation and Development (BMZ) opened their grounds to the public for an Open Day. 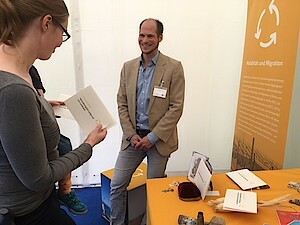 On the occasion of its 200th anniversary, the University of Bonn, besides other German and international science institutions presented a colourful programme under the header of sustainability which invited the visitor to watch, participate, touch and experiment at various booths. 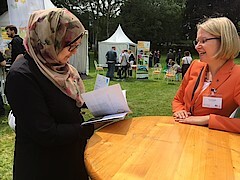 The Bonn Alliance for Sustainability Research, founded in November 2017, also presented its research focal points, which were “Digitization and Artificial Intelligence”, “Mobility and Migration”, and “Bioeconomics”, and which the visitor could experience at three thematic islands. The Alliance will provide information about the planned Innovation Campus Bonn (ICB), which is actively supported by the University of Bonn with its faculties and Center for Development Research (ZEF), the Hochschule Bonn-Rhein-Sieg, the German Development Institute (DIE), the United Nations University (UNU-EHS) and BICC (Bonn International Center for Conversion).